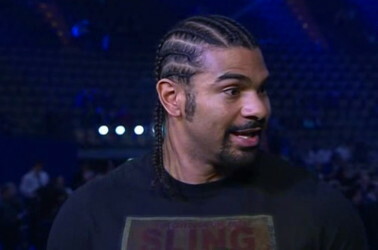 By Sean McDaniel: In a weird turn around, David Haye turned from foe to friend to the Klitschko brothers last night at the post Vitali Klitchko and Dereck Chisora fight press conference by slugging Dereck Chisora in the head when he made the mistake of walking up on Haye to talk with him about why he won’t fight. Chisora had in mind a fight in the ring, but unfortunately for him he got a fight outside of the ring when Haye decked him with a right hand to the head and landed a couple of additional shots before Chisora could make it to his feet. By landing that punch, Haye avenged the cheap shot slap that Chisora gave Vitali during Friday’s weigh-in, and Chisora’s spitting in Wladimir’s face before the fight. I’m sure Haye wasn’t seeing it as situation of him getting even for Klitschkos, as he seemed to be just looking out for himself to try and get an important fight against Vitali, but it worked out that way. Chisora’s tricks weren’t answered back by the Klitschkos, but Haye wasn’t going to take any of Chisora’s cheap shots for an instant. Haye didn’t even wait for Chisora to try and slap him; he just fired away to draw first blood and it worked out well for him. Haye ended up fighting not only Chisora but his trainer Don Charles as well, appearing to land a clean shot to the head. Chisora might be lucky that this brief fight occurred outside of the ring rather than in it because he not have lasted long.